Visit the Expecto sim as long as you can. The latest rage in SL is bound to be sued off the grid soon enough. "Mischief Managed SL are a non for profit Roleplaying group inspired by the Harry Potter books by J K Rowling, played within the metaverse of Second Life." Despite this disclaimer, I am pessimistic about the future of this truly fantastic sim. HP-licenses are harder to get than audiences with the pope and the US president on the same day. And - let's not beat around the bush - the truly magnificent castle build is a clear copy of what we know from the movies. 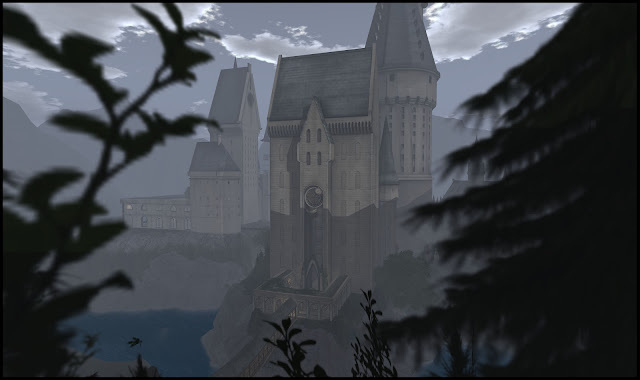 That said, the sim itself and the castle is among the best you will see in SL. Constructed almost entirely from mesh components, the quality of detail and texturing is amazing. The sim - if it survives - will act as roleplay environment for a post-Potter curriculum of wizardry. Right now it is on "public beta" - rumor says it will be closed to the public once regular roleplay starts. Good luck, girls and boys.